Both the dominant white alleles and the sabino-1 allele are variants of the same gene, the KIT gene. That is to say sabino-1 and dominant white could be considered allelic. The true roan allele (or possibly alleles) is (are) also allelic. Tobiano too occurs in the region, probably affecting the regulation of KIT rather than the KIT product itself. That is not, of course, to say that sabino-1 and white don't have distinctions at the phenotypic and genetic levels. The white mutations result in KIT proteins with extensive pieces missing or dysfunctional, sometimes the majority of the protein. Such proteins are dysfunctional, so that heterozygous individuals produce functional protein from only the wild type allele, and therefore have less of it than non-white horses. Homozygous individuals do not have working KIT protein, and by analogy with other animals, and considering the known functions of KIT, are predicted to be inviable (homozygous lethality). In contrast the sabino-1 gene is intron 16, a non coding region of the gene, and results in a small portion of the KIT protein being missing (that encoded by exon 17, out of 21 exons). 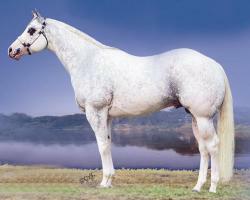 Horses homozygous for sabino may be extensively white, like dominant white, but their KIT protein is functional enough to carry out the essential life sustaining processes that are required of it. According to Nancy Castle (2009) "KIT mutations that cause depigmentation generally ranging from approximately 50% depigmented to all white phenotypes, and are also predicted to be embryonic lethal when homozygous, are classified as Dominant White. Mutations that are viable in the homozygous state are categorized as Sabino." One has to remember that current naming conventions predate molecular and other evidence. When horse colour genetics began there was no information about linkage, and not always the evidence for allelic identity, so seperate gene symbols were used to distinguish the phenotypes. Although not ideal often genes already have alternate names, due to historical reasons, and sometimes also cross species homoeology. (As an aside homoeology is an old and now little used term that indicates cross species homology. The term homology is now usually used instead, although it's not so precise in meaning). As with other genes (like extension) we could use the same gene symbol but name the alleles by phenotype, to give some clarity. If there turns out to be an unusually high number of alleles previously considered non-allelic I suspect there would be some confusion anyway. One could imagine that the "sabino" series might end up including roan alleles, and possibly even some of the appaloosa alleles too (I've heard breeders suggest it for snowcap, varnish and snowflake). As a colleague pointed out to me, the mouse geneticists already report DNA and breeders symbols side by side, but breeders nomenclature is not automatically replaced because of its usage: it's what people understand now. However in this case when we do think in terms of KIT DNA nomenclature the sabino/dominant white debate does not seem so significant: alleles for the KIT gene cause a range of pattern types, for which there are well established names for the phenotypes. I've been told that some supposed dominant white horses produce less extreme sabino foals - but I have not myself yet seen the evidence. I looked at the foals being born to Camarillo White Horse Association horses. These were either solid, or white. One was overo, but it was born of an overo mare, so no mystrey there. There are, however, only a few white horses there, as far as I could tell. 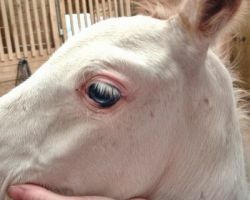 Given the multi-allelic nature of white I suspect that some white horses give only white or solid coloured foals, if not bred to a mate of pattern. Perhaps others with different alleles may also have less marked sabino foals. 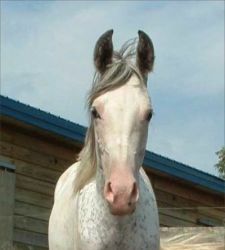 There is even the possibility of horses with both sabino and white alleles simultaneously, although probably not in linkage (that is to say one allele on the maternal chromosome and one on the paternal chromosome, one imagines that linkage of the two might just give an allele that acts as a white allele). 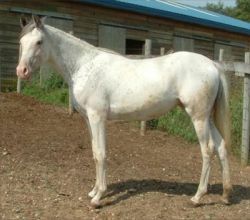 Old King, the founder of the American White Horse was reported to have 50% coloured and 50% white foals. One should not be surprised by this as owners of white mares usually choose white stallions (if white is their "thing") on a basis other than genotype. Such white horses might have sabino foals. 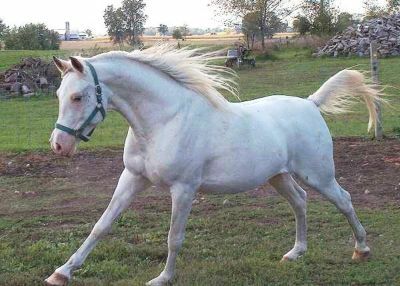 R Khasper is a dominant white born of non white parents, and a founder of dominant white in Arabian horses. His son, Kholor By Design (out of PCC Xeresh), was born almost completely white, and all pigment seemed to have disappeared by age two (photos below). Kholor By Design also has one almost completely blue eye and one blue eye with just a couple of small brown spots. Blue and partially blue eyes are usually thought to not be associated with dominant white, which normally have brown eyes. It may be that R Khasper’s paternal grand sire, Khemosabi, had Splash White, which can cause blue or partially blue eyes. 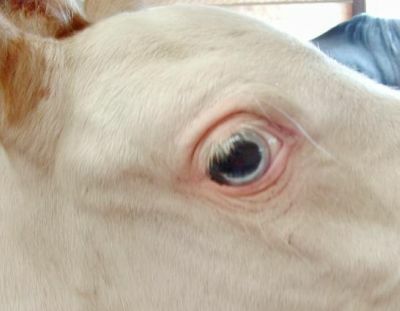 Alternatively R Khasper might have an as yet unidentified (possibly sabino-type) mutation that may sometimes causes blue or partial blue eyes. In either case Kholor By Design may have inherited both genes, giving partially blue eyes. Other offspring of R Khasper do not have blue eyes (see Khey To My Heart, for example, photos above).